By Mark - Chile - 31 Oct/02 - Viewed 1799 times. We got a bus to Puerto Natalies from the Bus Sur company as we had heard the border crossing was easier on their route. It cost C$10327 each and took about five hours on unpaved roads. We were going to rest a day in Puerto Natalies and spend two nights in the Torres Del Paine National Park, but the town didn't look that nice so we decided to have three nights in the park and leave first thing the next day. This meant a quick rush around town buying food to take with us and some new hiking shoes for me (My old ones had split down the middle of the sole in El Chalten. Only a month old - last time I buy Trespass shoes!). We were staying at a guesthouse called Niko's as both guidebooks had recommended it as helpful for organising hiking although I think all the hostels and guesthouses provide a similar service. 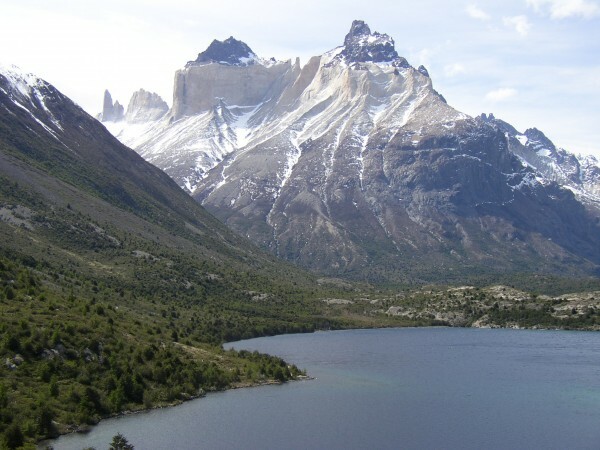 The Torres Del Paine National Park covers 181,000 ha and consists of different coloured lakes at only 100m above sea level and mountains rising to 3000m. There are 250km of marked paths so you do not need a guide. There are three huge granite towers (the Torres), three strange shaped horns (the Cuernos) and many other dramatic peaks. Accommodation is either camping or staying in Refugios which are like basic hostels, some of which can only be reached by trekking so all the supplies are carried up by horse. We were staying in the Refugios, which cost around C$11000 per person per night (dorms only). As the beds were expensive we hoped to save money by cooking our own food (meals were C$6000 with no choice of what you get). The landlady's English speaking daughter came round and told us all about the park and phoned to book the Refugios we had decided upon. We paid up front (some of the Refugios are cheaper in US Dollars, some are cheaper in Pesos) and bought an open return bus ticket (C$11000 each). Our initial plan of just two nights and a short walk had by now expanded to include most the 'W' trek, which is the most common way to walk round the park. We were doing it East to West, staying in Refugios Chileno, Los Cuernos and Pehoe and getting the boat and then bus back from Pehoe. The bus picked us up at 7am from the Hostel and got to the park about 10am. On the way we saw Llamas and Rheas (a bird like an Emu). We got out at Laguna Armarga (the first stop) and got the free minibus 7km to the Hosteria las Torres. This is as far as vehicles can go - it was all walking from here. The first hour and half towards Chileno was straight up, with really good views over the south of the park. Eventually it levelled out a bit as the path led along the side of a steep valley, occasionally crossing precarious scree slopes. It wasn't long before we could see the Refugio next to the river at the top of the valley. We checked in, both choosing top bunks and had lunch. The Refugio was modern (although it didn't have electricity) with a very well equipped kitchen. Whoever had lugged all these beds up here on horseback must have had fun. Power for cooking and lighting is supplied by gas and the main hall has large windows looking up towards the Torres. The two chefs (in classic chef costume) were very funny as they kept bursting into song (accompanied by acoustic guitar) whenever anyone came in. After lunch, we walked up to the base of the Torres with a German girl called Anna. This is two hours there and one and a half back. We tried our first glacial water on the way from a stream. The last part is climbing over the huge boulders that make up the moraine. It is worth it when you finally make it, the Torres seem far too high to stay up and there is a glacial lake at their base. Standing at the edge of the lake, you are almost completely surrounded by high granite walls. Back at Chileno we cooked our meal. After dinner, the two chefs went outside and sang as loudly as possible with full opera singer hand gestures. Nobody inside could here them, so it must have just been for their own (or the Condors') benefit. Once it got dark everyone went to bed. Today was supposed to be an easy day as it looked all downhill to Refugio los Cuernos, a mere four and a half hours away. The first half was fine and we had lunch by a lake and watched the birds. The second half seemed to go on forever and we climbed into and out of river valley after river valley. We kept thinking the Refugio would be over then next hill only to find another river valley. Eventually (after about five and a half hours) we saw it, and reached it just before it started to rain. This Refugio had beer and diet coke (C$1469 a can) so we treated ourselves. Los Cuernos is modern and built in the same style as Chileno, this time with views of the Cuernos. The chefs here were quieter and more helpful when we were cooking. One of them kept coming over and turning the oven up and the other kept coming over and turning it down. I think they lay on the chefs as entertainment. By now, there was a group of us (all from different European countries) that had been taking the same route since the beginning, so we had a nice evening sitting around talking and watching the rain. To get from los Cuernos to Pehoe (pronounced Pay-o-way) should take four hours. Halfway along, you can go two hours up the Valley of the Rio del Frances. It is supposed to be even better than the base of the Torres Del Paine, but we didn't think we could walk for eight hours in total as we were feeling very tired by now. With a tent you can camp at the base of the valley and go up and back in four hours without carrying all your stuff. Alternatively you can find someone with a tent to look after your stuff. Maybe next time. When we got to Pehoe, we decided to buy dinner instead of cook. Expensive, but we felt we deserved it. The Refugio is older than the others but still good, the view from the room was amazing. Without getting out of bed we could see Lake Pehoe on one side and the Cuernos on the other. The boat leaves from the Refugio, so Laura opted for no more walking. I wanted to see the Glacier Grey (the last arm of the W) so I walked an hour and half to the viewpoint. It is possible to walk three and a half hours right to the glacier, but there isn't time on the last morning because the boat leaves at 12.30pm. Unless you are really fit, to do this in only three nights without camping you need to go West to East (the bus at the other end leaves later so you have time to do the base of the Torres on the last morning). Or you can take more nights. The boat trip back has good views of the mountain and costs C$6000 each. Then we got the bus back to Niko's and went out for Pizza. We also bought a bus ticket to Rio Gallagos for 6.30am tomorrow. The plan is to get there about lunchtime and get an overnight bus to Puerto Madryn.